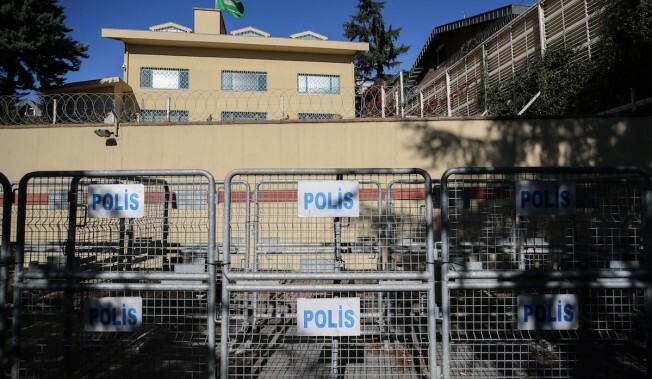 A police barricade outside the Saudi consulate as the waiting continues on the killing of Prominent Saudi journalist Jamal Khashoggi in Istanbul, Turkey on Oct. 27, 2018. Saudi Arabia's attorney general is scheduled to arrive in Turkey on Sunday to hold talks with investigators looking into the slaying of Saudi writer Jamal Khashoggi, who was killed in the kingdom's Istanbul consulate earlier this month. Turkey has said Saudi Arabia's top prosecutor, Saud al-Mojeb, is expected to discuss the latest findings of the investigation with Turkish investigators. There has been no announcement by the Saudis about the visit, which comes just days after CIA director Gina Haspel was in Turkey to review evidence before briefing the U.S. president. Turkey is seeking the extradition of 18 Saudi suspects detained in the kingdom in connection with the Oct. 2 killing. Saudi Arabia's foreign minister appeared to reject that notion in remarks on Saturday, saying the kingdom would try the perpetrators and bring them to justice after the investigation is completed. Some of those implicated in the killing are close to Crown Prince Mohammed bin Salman, whose condemnation of the killing has failed to ease suspicions that he was involved. Under mounting international pressure, the kingdom again changed its narrative about Khashoggi's killing, acknowledging in recent days that it was "premeditated," citing information from Turkey as part of a joint investigation. Saudi officials, however, continue to characterize the killing as a rogue operation carried out by agents who exceeded their authority. Saudi Foreign Minister Adel al-Jubeir on Saturday said the global outcry and media focus on the killing had become "fairly hysterical." He urged the public to wait for the results of the investigation before ascribing blame to the kingdom's top leadership. Turkey is pressing Saudi Arabia for a full disclosure about the killing. Turkey alleges a 15-member hit squad was sent to Istanbul to kill the journalist. Turkish President Recep Tayyip Erdogan said Friday that his country would reveal more evidence about the killing but was not in any rush to do so, indicating that Turkish authorities will keep methodically increasing pressure on Saudi Arabia.